First stop Carlisle, PA to pick up the new merchandise. Thanks Dan! Tour of Year One with Mike Ashmore. ...Year One...Greg, Tyler & myself presenting a shirt to Kevin King. Smoky & The Bandit Movie Tour! The Movie Tour meeting with Tyler Hambrick giving the details. ...The Movie Tour...The Fairgrounds, old roller coaster location. ...The Movie Tour...Buford T. Justice loses roof. ...The Movie Tour...Buford T. Justice horn gets stuck here. ...The Movie Tour...Kevin standing in stuck horn scene. ...The Movie Tour...night scene getting chased by 1st cop. ...The Movie Tour...location of Snowman's house. ...The Movie Tour...Rolling in to get some Coors Beer. ...The Movie Tour...lunch break, having fun with the police. 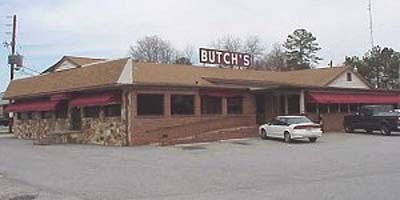 ...The Movie Tour...lunch break at Butch's Chicken House. ...The Movie Tour...the bridge jump scene. ...The Movie Tour...pond where Fred takes a swim. ...The Movie Tour...scene where Texas sign is shown. The Year One Experience. My concept T/A on display. ...The YOEX...our display with Restore A Muscle Car. ...The YOEX...Paul & Shannon's T/A with new Snowflakes. ...The YOEX...Greg Vaser's SE 4 speed T/A. ...The YOEX...Tyler Hambrick's SE T/A. ...The YOEX...Snowman's Trailer Banner - Thanks Greg!. ...The YOEX...Kevin & Tyler driving the T/A toys. ...The YOEX...Jim Wangers in the GeeTO TIGER!. ...The YOEX..."Original Survivor" 1974 Chicago Auto Show Trans Am. ...The YOEX...Mike Ashmore & Kevin Morgan. ...The YOEX...Greg Vaser, Kevin Morgan & Tyler Hambrick. ...The YOEX...Al Valor of US Wheel & Kevin Morgan. Back home in Canton, Pennsylvania. 1728.6 miles round trip. The marks appearing on this website including, but not limited to: GM and the GM Logo; Chevrolet, Pontiac, and their respective logos, emblems, slogans and vehicle model names and body designs; are trademarks and/or service marks of General Motors Corporation, its subsidiaries, affiliates or licensors.